Your digital camera can probably generate also small videos. An animalscene, a waterfall, an arrival of railway train, a musical scene can bringnot only life in the static slide show, but also the original sound. Evenvideos on DVD can be played under certain conditions before the staticpicture background. An especially high image quality deliver the already mentioned vector animations. They adapt themselves to the screen resolution and can produce in the full screen every conceivable scene excellently. In addition here one more example. With these possibilities rises DIGISTUDIO well over the usual conventional and digital slide show. Every slide show can show pictures. To show text looks clearly different. But only with text the slide show also in case of the consideration by third becomes usable. If you want to give away a CD of your holiday impressions, text is inalienable, e.g., in the form of subtitles. But also the wish for show titles and intertitles with different graphic design is legitimate. Or how one gets, for example, a legend, a poem or quite simply a chapter from the travel diary in the slid show. DIGISTUDIO offers unique and elegant solutions. But DIGISTUDIO offers even more on the subject text. How often it gives for a motive one or more detail images which could stretch the slide show as independent pictures artificially and don't express the connection so well. For example, a castle and his architectural details or a mountain pasture and an insect or a natural monument and the tip board. DIGISTUDIO can indicate at first the main picture and then fade in partial pictures successively in eligible size, position and border design. Indeed, this feature goes in the direction of multivision show and brings change and movement in the primitive sequence of same-format pictures. What are the requirements for a photo archive? It must hold ready called drawers for pictures belonging together. It must be possible to activate a single complex in every situation immediately. The specific search for pictures, e.g., to the "Eiffel Tower" must be possible. In the end, it must be possible to call the pictures sequential successively, how by a normal presentation. It must be possible to save the archive on CD or USB stick and to restore it on another computer in the full achievement circumference. It must be possible to combine the pictures with short and long descriptions and to show the descriptions optionally in connection with the pictures. All these demands ... and still some more fulfils DIGISTUDIO - the photo archive. Television in HDTV opens a new and fascinating perspective for the classical slide show. 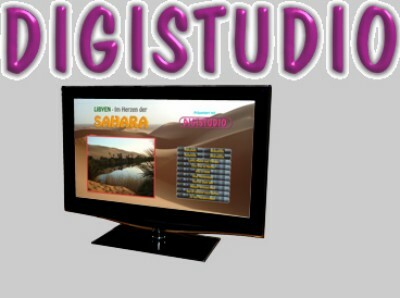 DIGISTUDIO in the rating of 16:9 HDTV givs on a modern television a brilliant picture in connection with a laptop. Due to Adobe Flash can keep up DIGISTUDIO up to the highest possible resolution of 1920*1080 pixel. All animated features of DIGISTUDIO are available in unrestricted of graphic varieties, like title, subheadings, subtitles, charts, text spots and videos. In addition can be used also during a presentation in connection with the television over 25 control functions. A DIGISTUDIO presentation cannot be shown with a DVD player. While with videos only few control functions are possible, allowed a DIGISTUDIO presentation the use of an animated showing cursor, an interactive picture list with preview and search function, the scrolling of panoramas or portrait documents, the turning in more extensive texts, the invisible sound control, purposeful jumping to a picture and much different one. In addition the production of a high-resolution video for DVD player takes several hours. If only one individual spelling mistake is to corrected or one individual picture is to be deleted or shifted, is this extensive procedure to be repeated. A DIGISTUDIO presentation is after each change immediately executable. Digital technique replaced the classical slide. No more blur by thermal expansion of the film material. No dust, no scratches, no fading of the colors. No changes of the magazin of slides, no jam in the projector. Inplace of many magazins of slides one CD or DVD is enough, which starts automatically without preparation and which one can also multiply and give away. DIGISTUDIO can fully hide the computer image. Windows screen becomes invisible befor starting and after ending show. Invisible volume control. Switched off Mouse cursor. Instead operating with mouse and pop up menus is it possible to operate with keypad. Switched on or off attractive special cursor instead of laser pointer. Speedy Soft DIGISTUDIO v9.2.3.231.b.7.3.12 Bilanguage rapidshare mediafire megaupload hotfile download, Speedy Soft DIGISTUDIO v9.2.3.231.b.7.3.12 Bilanguage torrent emule download, Speedy Soft DIGISTUDIO v9.2.3.231.b.7.3.12 Bilanguage full free download, Speedy Soft DIGISTUDIO v9.2.3.231.b.7.3.12 Bilanguage rar zip password or anything related.